Extra-immersive, tear-free gaming doesn’t come cheap. 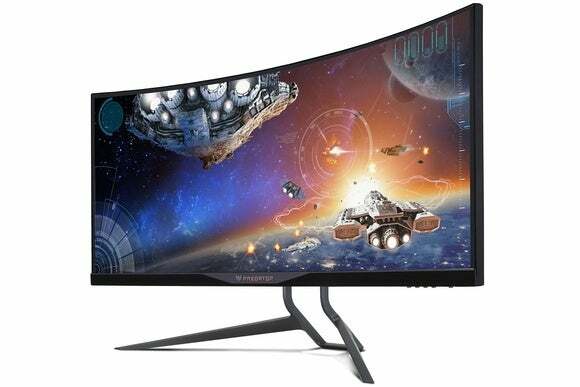 After announcing its first curved monitor with Nvidia G-Sync technology way back in April, Acer is finally ready to sell this gaming monstrosity. The Predator X34 has a 34-inch, curved IPS panel, with a resolution of 3440-by-x1440 pixels. That’s a 21:9 aspect ratio, making it much wider than a typical desktop monitor. The refresh rate is 60Hz by default, but Acer will let users overclock the monitor to 100Hz to cut down on motion blur. The main attraction is Nvidia’s G-Sync technology, which uses a dedicated chip to keep each frame in line with the refresh rate of the display, in conjunction with Nvidia graphics cards. This helps avoid the stuttering and tearing that can occur when the display and frame rate fall out of sync. While we’ve seen G-Sync monitors before, Acer claims it’s the first in the United States to combine the technology with a curved display. Users of AMD Radeon graphics cards, meanwhile, can look to Acer’s XR341CK , which is essentially the same panel but with AMD’s FreeSync technology instead of G-Sync. The two technologies are similar , though AMD’s tech doesn’t require a special module in the monitor. As such, it’s about $200 cheaper than the Predator X34. Why this matters: Monitors with variable display rate technology started hitting the market in earnest earlier this year, and Acer’s curved panel represents the high-end of the spectrum. This is what you buy if you’ve got money to burn (and don’t mind being locked into Nvidia graphics cards for as long as you’re using the monitor).